Passages to the Past: The French Mistress Giveaway! The daughter of a poor nobleman, Louise leaves the French countryside for the court of King Louis XIV, where she must not only please the tastes of the jaded king, but serve as a spy for France. With few friends, many rivals, and ever-shifting loyalties, Louise learns the perils of her new role. Yet she is too ambitious to be a pawn in the intrigues of others. With the promise of riches, power, and even the love of a king, Louise creates her own destiny in a dance of intrigue between two monarchs—and two countries. Giveaway ends on July 6th. Winner will be announced on July 7th. Special thanks to Susan Holloway Scott for making this giveaway possible!! Please enter me! I love historical fictions about the court of Louis XIV. I'm also already a follower! Ooh, am I first? I would love to read this book! Thanks for the giveaway! This sounds great. Thanks Amy and Susan for the opportunity. I am a follower and I posted it on my blog sidebar http://themaidenscourt.blogspot.com/. I'm a follower on facebook! Sign me up! Sounds good! Please count me in. "The French Mistress" sounds intriguing. Thanks for the chance to win a copy. I'm a new follower (Deborah). The book sounds interesting. And I like its cover. :D Please count me in. I'd love a chance to win. :) I am a follower. And I blogged: http://www.morbid-romantic.net/2009/06/15/book-giveaways-0615-0621/. The book sounds good, please add me. I am a Google Reader follower, my details are on there. Please add me into the draw! 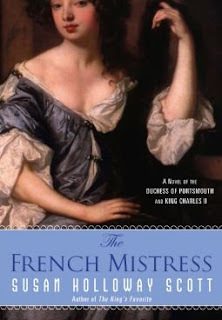 I am really interested in reading about this mistress of Charles, as she seems to take a back seat to Barbara Castlemaine and Nell Gywnn in the histories and novels thus far. I'd love to win this book; I've just recently become interested in French historical fiction. Oh I love historical fiction! I would love to win this! My kind of book. Would love to win! I'm a follower. Thanks so much for hosting this giveaway! In case I forget to post, I wanted to tell you that this Giveaway will be mentioned in my Waiting On Wednesday post, on Wednesday the 24th. I love Susan Holloway Scott's books! Enter me please. One of my passions is historical fiction. Count me in this giveaway. Count me in. I follow you. I must, must, must enter for this one! I already follow and I'm going to pop this up on my sidebar if that counts. I would love to win this book. Thanks for hosting this giveaway. I am a follower. Would love to be entered. Thanks for running the contest--the book looks very fun. Please enter me! This book sounds great! Hi Amy, I'd love to win a copy of this book. I'm a follower! Hi Amy, I'd love to win this book and I'm a follower. I'd love to enter. I'm very interested in reading about Louise. Sign me up. i'm a floower from facebook. What a fantastic blog you have here, Amy! This is my first visit and I'm glad to have found you. Please enter me into the giveaway, I'd love to read this book. Amy, please enter me, too! I am a follower. Oh yes, I'd love to read this, please sign me up ! Thanks Amy ! Oooh I've had my eye on this book. Long time follower! Oops - forgot to mention, I'm a follower, too. I would like to participate! I am a follower, too. Currently I'm reading Royal Harlot - I really like Susan Holloway Scott. Sorry if I end up commenting twice, I did just comment but I am not seeing it come up. Anyway, I would like to participate! I am a follower too. Thanks for this lovely giveaway! I am now a follower and have blogged about this on my sidebar! Sounds good include me please. I'm a follower too. Oh thank you! You always have fantastic giveaways! Please enter me in the draw! I am a current subscriber and love your blog. Hi Amy, I'd love to win this one, I have a few of Susan Holloway Scott's novels and have really enjoyed them! Sounds intriguing...I'd love to read it. I would love to win this one! Count me in. Enter me, please. I'm a follower :) I also added the link to my blog. Oooh! Aside from wanting to enter the contest, I absolutely ADORE your header!!! I do *so* want to steal it, but I'm restraining myself! I know the chances of me winning are...um....SLIM...BUT I'd be thrilled to win the book, being a royal lover and all. The novel sounds wonderful. But good luck to everyone else as well. wow, thanks!! i'd like to sign up too. Count me in and I'm following! I have followed through my reader, but I signed up on your blog too. I see you read and review Tory Widow also. I have to go read your review. Will also become a follower and post about the giveaway on my blog! Thanks for the giveaway. I would like to read this book. Pls enter me in this giveaway! thanks! A few weeks pass uneventfully. But one afternoon, a local cowhand comes running through town yelling, "Big John is coming to town!! Run for your lives!!!" When the bartender exits the saloon to start running, he's knocked to the ground by several townspeople scurrying out of town. As he's picking himself up, he sees a large man approaching the saloon, probably about 7 feet tall, muscular, grunting and growling as he walks. He stomps up to the door, orders the poor barkeep inside, and demands, "I want a beer NOW!!" He pounds his heavy fist on the bar, splitting it in half. The bartender nervously hands the big man a beer, hands shaking. He takes the beer, rips the top of the bottle off with his teeth, and downs the beer in one gulp. As the poor timid bartender cowers behind the bar, the big man gets up to leave. "Do you want another beer?" the bartender calls out. "Dang it, I don't have time!!" the big man yells. "I gotta get out of town!!! Didn't ya hear Big John is a-comin??" Maybe I can get lucky! I just found your blog last night and am now a follower. Please enter me to win! I would love to win--and I'm now following through Google. Thanks! This one's already on my wishlist - so please count me in - I'd love to be lucky! Count me in! I LOVED Royal Harlot! I'm a follower on Blogger and Networked Blogs through FB. I'd love to read this! Please enter me!! You have the best giveaways!! Enter me please! Wow, a lot of people want this one! Count me in! I'm a follower. Would be a joy to be in this contest for THE FRENCH MISTRESS. Beautiful! Please do enter me. Thanks! Sounds like this is an interesting book. I would love a The French Mistress! So great! Please enter me! Count me to the giveaway, please! +5 Entries: New follower through blogger. I am deeply interested in this book. Ooh, I just love historical fiction set in France. Please enter me in the drawing. Hope you're having a great 4th of July. I hope I will be lucky! Please enter me, it sounds great and I'm already a loyal follower. Thanks! Beautiful looking book - I really like your blog too. New folloer on facebook and google. Love the blog...please enter me. I'm a follower, and I posted this on my blog.